Instructional scaffolding is the support given during the learning process which is tailored to the needs of the student with the intention of helping the student achieve his/her learning goals. This learning process is designed to promote a deeper level of learning. Instructional scaffolding provides sufficient support to promote learning when concepts and skills are being first introduced to students. These supports may include resource, compelling task, templates and guides, and/or guidance on the development of cognitive and social skills. Instructional scaffolding could be employed through modeling a task, giving advice, and/or providing coaching. There are three essential features of scaffolding that facilitate learning. The first feature has to do with the interaction between the learner and the expert. This interaction should be collaborative for it to be effective. The second, learning should take place in the learner's zone of proximal development. To do that the expert needs to be aware of the learner's current level of knowledge and then work to a certain extent beyond that level. The third feature of scaffolding is that the scaffold, the support and guidance provided by the expert, is gradually removed as the learner becomes more proficient. The support and guidance provided to the learner is compared to the scaffolds in building construction where the scaffolds provide both "adjustable and temporal" support to the building under construction. The support and guidance provided to learners facilitate internalization of the knowledge needed to complete the task. This support is weaned gradually until the learner is independent. The selection of the learning task: The task should ensure that learners use the developing skills that need to be mastered. The task should also be engaging and interesting to keep learners involved. The anticipation of errors: After choosing the task, the teacher needs to anticipate errors the learners are likely to commit when working on the task. Anticipation of errors enables the scaffolder to properly guide the learners away from ineffective directions. The application of scaffolds during the learning task: Scaffolds could be organized in "simple skill acquisition or they may be dynamic and generative". The consideration of emotive or affective factors: Scaffolding is not limited to a cognitive skill but it also relates to emotive and affect factors. During the task the scaffolder (expert) might need to manage and control for frustration and loss of interest that could be experienced by the learner. Encouragement is also an important scaffolding strategy. Scaffolding theory was first introduced in the late 1950s by Jerome Bruner, a cognitive psychologist. He used the term to describe young children's oral language acquisition. Helped by their parents when they first start learning to speak, young children are provided with informal instructional formats within which their learning is facilitated. A scaffolding format investigated by Bruner and his postdoctoral student Anat Ninio whose scaffolding processes are described in detail is joint picture-book reading (Ninio & Bruner, 1978). By contrast, bed-time stories and read alouds are examples of book-centered parenting events (Daniels, 1994) without scaffolding interaction. Scaffolding is inspired by Lev Vygotsky's concept of an expert assisting a novice, or an apprentice. Scaffolding is changing the level of support to suit the cognitive potential of the child. Over the course of a teaching session, one can adjust the amount of guidance to fit the child's potential level of performance. More support is offered when a child is having difficulty with a particular task and, over time, less support is provided as the child makes gains on the task. Ideally, scaffolding works to maintain the child's potential level of development in the ZPD. An essential element to the ZPD and scaffolding is the acquisition of language. According to Vygotsky, language (and in particular, speech) is fundamental to children's cognitive growth because language provides purpose and intention so that behaviors can be better understood. Through the use of speech, children are able to communicate to and learn from others through dialogue, which is an important tool in the ZPD. In a dialogue, a child's unsystematic, disorganized, and spontaneous concepts are met with the more systematic, logical and rational concepts of the skilled helper. Empirical research suggests that the benefits of scaffolding are not only useful during a task, but can extend beyond the immediate situation in order to influence future cognitive development. For instance, a recent study recorded verbal scaffolding between mothers and their 3- and 4-year-old children as they played together. Then, when the children were six years old, they underwent several measures of executive function, such as working memory and goal-directed play. The study found that the children's working memory and language skills at six years of age were related to the amount of verbal scaffolding provided by mothers at age three. In particular, scaffolding was most effective when mothers provided explicit conceptual links during play. Therefore, the results of this study not only suggest that verbal scaffolding aids children's cognitive development, but that the quality of the scaffolding is also important for learning and development. A construct that is critical for scaffolding instruction is Vygotsky's concept of the zone of proximal development (ZPD). Zone of proximal development is that field between what a learner can do by himself (expert stage) and what can be achieved with the support of a knowledgeable peer or instructor (pedagogical stage) (Ellis & Worthington, 1994). Vygotsky was convinced that a child could be taught any subject efficiently using scaffolding practices by implementing the scaffolds at the Zone of proximal development. Students are escorted and monitored through learning activities that function as interactive conduits to get them to the next stage. Thus the learner obtains or raises new understandings by presenting on their prior knowledge through the support delivered by more capable individuals (Raymond, 2000). Several peer reviewed studies have shown that when there is a deficiency in guided learning experiences and social interaction, learning and development are obstructed (Bransford, Brown, and Cocking, 2000). In writing instruction, typically support is presented in verbal form (discourse). The writing tutor engages the learner's attention, calibrates the task, motivates the student, identifies relevant task features, controls for frustration, and demonstrates as needed (Rodgers, 2004). Through joint activities, the teacher scaffolds conversation to maximize the development of a child's intrapsychological functioning. In this process, the adult controls the elements of the task that are beyond the child's ability all the while increasing the expectations of what the child is able to do. Speech, a critical tool to scaffold thinking and responding, plays a crucial role in the development of higher psychological processes (Luria, 1979) because it enables thinking to be more abstract, flexible, and independent (Bodrova & Leong, 1996). From a Vygotskian perspective, talk and action work together with the sociocultural fabric of the writing event to shape a child's construction of awareness and performance (Dorn, 1996). Dialogue may range from casual talk to deliberate explanations about features of written language. The talk embedded in the actions of the literacy event shapes the child's learning as the tutor regulates his or her language to conform to the child's degrees of understanding. Clay (2005) shows that what may seem like casual conversational exchanges between tutor and student actually offer many opportunities for fostering cognitive development, language learning, story composition for writing, and reading comprehension. Conversations facilitate generative, constructive, experimental, and developmental speech and writing in the development of new ideas (Smagorinsky, 2007). In Vygotsky's words, "what the child is able to do in collaboration today he will be able to do independently tomorrow" (Vygotsky, 1987, p. 211). Some ingredients of scaffolding are predictability, playfulness, focus on meaning, role reversal, modeling, and nomenclature. According to Saye and Brush, there are two levels of scaffolding: soft and hard (2002). An example of soft scaffolding in the classroom would be when a teacher circulates the room and converses with his or her students (Simon and Klein, 2007). The teacher may question their approach to a difficult problem and provide constructive feedback. According to Van Lier, this type of scaffolding can also be referred to as contingent scaffolding. The type and amount of support needed is dependent on the needs of the students during the time of instruction (Van Lier, 1996). Unfortunately, applying scaffolding correctly and consistently can be difficult when the classroom is large and students have various needs (Gallagher, 1997). Scaffolding can be applied to a majority of the students, but the teacher is left with the responsibility to identify additional scaffolding. In contrast with contingent or soft scaffolding, embedded or hard scaffolding is planned in advance to help students with a learning task that is known in advance to be difficult (Saye and Brush, 2002). For example, when students are discovering the formula for the Pythagorean Theorem in math class, the teacher may identify hints or cues to help the student reach an even higher level of thinking. In both situations, the idea of "expert scaffolding" is being implemented (Holton and Clarke, 2006): the teacher in the classroom is considered the expert and is responsible for providing scaffolding for the students. Reciprocal scaffolding, a method first coined by Holton and Thomas, is a method that involves a group of two or more collaboratively working together. In this situation, the group can learn from each other's experiences and knowledge. The scaffolding is shared by each member and changes constantly as the group works on a task (Holton and Clarke, 2006). According to Vygotsky, students develop higher-level thinking skills when scaffolding occurs with an adult expert or with a peer of higher capabilities (Stone, 1998). Conversely, Piaget believes that students discard their ideas when paired with an adult or student of more expertise (Piaget, 1928). Instead, students should be paired with others who have different perspectives. Conflicts would then take place between students allowing them to think constructively at a higher level. Technical scaffolding is a newer approach in which computers replace the teachers as the experts or guides, and students can be guided with web links, online tutorials, or help pages (Yelland and Masters, 2007). Educational software can help students follow a clear structure and allows students to plan properly (Lai and Law, 2006). Silliman and Wilkinson (1994) distinguish two types of scaffolding: 'supportive scaffolding' that characterises the IRF (Initiation-Response-Follow-up) pattern; and 'directive scaffolding' that refers to IRE (Initiation-Response-Evaluation). Saxena (2010) develops these two notions theoretically by incorporating Bhaktin's (1981) and vanLier's (1996) works. Within the IRE pattern, teachers provide 'directive scaffolding' on the assumption that their job is to transmit knowledge and then assess its appropriation by the learners. The question-answer-evaluation sequence creates a predetermined standard for acceptable participation and induces passive learning. In this type of interaction, the teacher holds the right to evaluate and asks 'known-information' questions which emphasise the reproduction of information. The nature and role of the triadic dialogue have been oversimplified and the potential for the roles of teachers and students in them has been undermined (Nassaji and Wells, 2000). If, in managing the talk, teachers apply 'constructive power' (Saxena, 2009) and exploit students' responses as occasions for joint exploration, rather than simply evaluating them, then the classroom talk becomes dialogic (Nystrand, 1997). The pedagogic orientation of this talk becomes 'participation orientation', in contrast to 'display/assessment orientation' of IRE (van Lier, 1996). In this kind of pattern of interaction, the third part of the triadic dialogue offers 'follow-up' and teachers' scaffolding becomes 'supportive'. Rather than producing 'authoritative discourse' Bakhtin's (1981), teachers constructs 'internally persuasive discourse' that allows 'equality' and 'symmetry' (van Lier, 1996:175), wherein the issues of power, control, institutional managerial positioning, etc. are diffused or suspended. The discourse opens up the roles for students as the 'primary knower' and the 'sequence initiator' (Nassaji and Wells, 2000), which allows them to be the negotiator and co-constructor of meaning. The suspension of asymmetry in the talk represents a shift in the teacher's ideological stance and, therefore, demonstrates that supportive scaffolding is more than simply a model of instruction (Saxena, 2010: 167). Learner support in scaffolding is known as guidance. While it takes on various forms and styles, the base of guidance is any type of interaction from the instructor that is intended to aid and/or improve student learning. While this a broad definition, the role and amount of guidance is better defined by the instructor's approach. Instructionists and constructionists approach giving guidance within their own instructional frameworks. Scaffolding involves presenting learners with proper guidance that moves them towards their learning goals. Providing guidance is a method of moderating the cognitive load of a learner. In scaffolding, learners can only be moved toward their learning goals if cognitive load is held in check by properly administered support. Instructionists tend to give a higher level of guidance in light of the inquiry driven style of learning. With each piece of a complex task being broken down, instructors give guidance for each of the separated parts of the learning. In this way, higher guidance is a function of reducing cognitive load when students are working in a more individual manner. Constructivists approach guidance differently as a result of their focus on transfer. The concept of transfer focuses on a learner's ability to apply learned tasks in a context other than the modality in which it was learned. This results in constructivists giving a lower level of guidance, as learners work through a complete task, only being given guidance in transfer. The role of guidance is to ensure that cognitive load is moderated while the learner works at more complete and complex task; guidance is given during aspects of the task that will help enable transfer. Research has demonstrated that higher level of guidance has a greater effect on scaffolded learning, but is not a guarantee of more learning. The efficacy of higher amount of guidance is dependent on the level of detail and guidance applicability. Having multiple types of guidance (i.e. worked examples, feedback) can cause them to interact and reinforce each other. Multiple conditions do not guarantee greater learning, as certain types of guidance can be extraneous to the learning goals or the modality of learning. With this, more guidance (if not appropriate to the learning) can negatively impact performance, as it gives the learner overwhelming levels of information. However, appropriately designed high levels of guidance, which properly interact with the learning, is more beneficial to learning than low levels of guidance. Constructivists pay close attention to the context of guidance, because they believe instruction plays a major role in knowledge retention and transfer. Research studies demonstrate how the context of isolated explanations can have an effect on student-learning outcomes. For example, Hake's (1998) large-scale study demonstrated how post-secondary physics students recalled less than 30% of material covered in a traditional lecture-style class. Similarly, other studies illustrate how students construct different understandings from explanation in isolation versus having a first experience with the material. A first experience with the material provides students with a "need to know", which allows learners to reflect on prior experiences with the content, which can help learners construct meaning from instruction. Worked examples are guiding tools that can act as a "need to know" for students. Worked examples provide students with straightforward goals, step-by-step instructions as well as ready-to-solve problems that can help students develop a stronger understanding from instruction. Guiding has a key role both in constructivism and 'instructivism'. For instructivists the timing of guidance is immediate, either at the beginning or when the learner makes a mistake, whereas in constructivism it can be delayed. It has been found that immediate feedback can lead to working memory load as it does not take in consideration the process of gradual acquisition of a skill, which also relates to the amount of guidance being given. Research on intelligent-tutoring systems suggests that immediate feedback on errors is a great strategy to promote learning, as the learner is able to integrate the feedback from short-term memory into the overall learning and problem solving task; the longer the wait on feedback, the harder it is for the learner to make this integration. Yet, in another study it was found that providing feedback right after the error can deprive the learner of the opportunity to develop evaluative skills. Wise and O'Neill bring these two, seemingly contradictory findings, and argue that it does not only prove the importance of the role of feedback, but that points out a timing feature of feedback: immediate feedback in the short term promotes more rapid problem solving but delaying feedback can result in better retention and transfer in the long term. Constructivism views knowledge as a "function of how the individual creates meaning from his or her own experiences". Constructivists advocate that learning is better facilitated in a minimally guided environment where learners construct important information for themselves. According to constructivism, minimal guidance in the form of process or task related information should be provided to learners upon request and direct instruction of learning strategies should not be used because it impedes the natural processes learners use to recall prior experiences. In this view, for learners to construct knowledge they should be provided with the goals and minimal information and support. Applications that promote constructivist learning require learners to solve authentic problems or "acquire knowledge in information-rich settings". An example of an application of constructivist learning is science instruction, where students are asked to discover the principles of science by imitating the steps and actions of researchers. Instructionism are educational practices characterized for being instructor-centered. Some authors see instructionism as a highly prescriptive practice that mostly focuses on the formation of skills, that is very product-oriented and is not interactive; or that is a highly structured, systematic and explicit way of teaching that gives emphasis to the role of the teacher as a transmitter of knowledge and the students as passive receptacles. The 'transmission' of knowledge and skills from the teacher to the student in this context is often manifested in the form of drill, practice and rote memorization. An 'instructionist', then, focuses on the preparation, organization and management of the lesson making sure the plan is detailed and the communication is effective. The emphasis is on the up-front explicit delivery of instruction. Instructionism is often contrasted with constructivism. Both of them use the term guidance as means to support learning, and how it can be used more effectively. The difference in the use of guidance is found in the philosophical assumptions regarding the nature of the learner, but they also differ in their views around the quantity, the context and the timing of guidance. An example of application of instructionism in the classroom is direct instruction. Instructional scaffolding can be thought of as the strategies that a teacher uses to help learners bridge a cognitive gap or progress in their learning to a level they were previously unable to accomplish. These strategies evolve as the teachers evaluate the learners initial level of ability and then through continued feedback throughout the progression of the task. In the early studies, scaffolding was primarily done in oral, face- to-face learning environments. In classrooms, scaffolding may include modelling behaviours, coaching and prompting, thinking out loud, dialogue with questions and answers, planned and spontaneous discussions, as well as other interactive planning or structural assistance to help the learner bridge a cognitive gap. This can also include peer mentoring from more experienced students. "MKO" stands for More Knowledgeable Other. The "MKO" is a person who is has a higher understanding of an idea or concept and can bridge this cognitive gap. This includes teachers, parents, and as stated before, peers. There are a wide variety of scaffolding strategies that teachers employ. One approach to looking at the application of scaffolding is to look at a framework for evaluating these strategies. This model was developed based on the theoretical principles of scaffolding to highlight the use of scaffolding for educational purposes. It highlights two components of an instructors use of scaffolding. The first is the instructors intentions and the second refers to the means by which the scaffolding is carried out. Any combination of scaffolding means with scaffolding intention can be construed as a scaffolding strategy, however, whether a teaching strategy qualifies as good scaffolding generally depends upon its enactment in actual practice and more specifically upon whether the strategy is applied contingently and whether it is also part of a process of fading and transfer of responsibility. Advanced organizers Tools that present new information or concepts to learners. Modelling Instructors demonstrate desired behaviour, knowledge or task to students. Worked examples A worked example is a step-by-step demonstration of a complex problem or task.. These types of instructional materials are commonly implemented in mathematics and science classes and include three key features: 1. Problem formation: A principle or theory is introduced. 2. Step-by-step example: A worked example, that demonstrates how the student can solve the problem, is provided. 3. Solution to the problem: One or more read-to-be solved problems are given for the student to practice the skill. Concept Maps Graphical tools for organizing, representing and displaying the relationships between knowledge and concepts. Explanations Ways in which instructors present and explain new content to learners. How new information is presented to the learner is a critical component for effective instruction. The use of materials such as visual images, graphic organizers, animated videos, audio files and other technological features can make explanations more engaging, motivating and meaningful for student learning. Handouts A supplementary resource used to support teaching and learning. These tools can provide students with the necessary information (i.e. concept or theory, task instructions, learning goals, learning objectives) and practice (i.e. ready-to-be-solved problems) they need to master new content and skills. Handouts are helpful tools for explanations and worked examples. Prompts A physical or verbal cue to aid recall of prior or assumed knowledge. Physical: body movements such as pointing, nodding, finger or foot tapping. Verbal: words, statements and questions that help the learner respond correctly. Positional: placing materials in a specific location that prompts positive student reaction. When we teach students who are not physically present in the classroom, instructors need to adapt to the environment and their scaffolding needs to be adjusted to fit this new learning medium. It can be challenging to find a way to adjust the verbal and visual elements of scaffolding to construct a successful interactive and collaborative learning environment for distance learning. The recent spread of technology used in education has opened up the learning environment to include hypermedia, hypertext, collaborative learning environments, and web-based learning environments. This challenges traditional learning design conceptions of scaffolding for educators. metacognitive scaffolding: prompts students to think about what they are learning throughout the process and assists students reflecting on what they have learnt (self-assessment). This is the most common research area and is thought to not only promote higher order thinking but also students ability to plan ahead. Reingold, Rimor and Kalay have listed seven mechanisms of metacognitive scaffolding that encourage students' metacognition in learning. 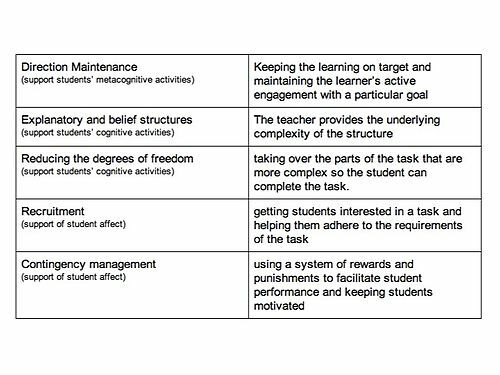 These four types are structures that appropriately support students' learning in online environments. Other scaffolding approaches that were addressed by the researchers included: technical support, content support, argumentation template, questioning and modelling. These terms were rarely used, and it was argued that these areas had unclear structure to guide students, especially in online learning, and were inadequately justified. As technology changes, so does the form of support provided to online learners. Instructors have the challenge of adapting scaffolding techniques to this new medium, but also the advantage of using new web-based tools such as wikis and blogs as platforms to support and discuss with students. As the research in this area progresses, studies are showing that when students learn about complex topics with computer-based learning environments (CBLEs) without scaffolding they demonstrated poor ability to regulate their learning, and failure to gain a conceptual understanding of the topic. As a result, researchers have recently begun to emphasize the importance of embedded conceptual, procedural, strategic, and metacognitive scaffolding in CBLEs. scaffolding can help in group discussions. In a recent study, a significant increase in active participation and meaningful negotiations was found within the scaffolded groups as opposed to the non-scaffolded group. metacognitive scaffolding can be used to encourage students in reflecting and help build a sense of a community among learners. Specifically, Reingold, Rimor and Kalay recommend using metacognitive scaffolding to support students working on a common task. They believe this can support learners to experience their work as part of a community of learners. An online learning environment warrants many factors for scaffolding to be successful, this includes basic knowledge of the use of technology, social interactions and reliance on student’s individual motivation and initiative for learning. Collaboration is key to instructional scaffolding and can be lost without proper guidance from an instructor creating and initiating an online social space. The instructor’s role in creating a social space for online interaction has been found to increase student’s confidence in understanding the content and goals of the course. If an instructor does not create this space a student misses out on critical-thinking, evaluating material and collaborating with fellow students to foster learning. Even with instructors implementing a positive social space online, a research study found that students perceptions of incompetence to other classmates is not affected by positive online social spaces but found this to be less of a problem in face-face courses. Due to the distance learning that encompasses an online environment, self-regulation is essential for scaffolding to be effective, a study has shown that procrastinators are at a disadvantage in online distance learning and are not able to be scaffolded in the same degree as if there was an in-person instructor. Students who had more desire to master the content than to receive higher grades were more successful in the online courses. A study by Artino and Stephens  found that graduate students were more motivated in online course than undergraduate students but suggests academic level may contribute to the amount of technological support that is needed for positive learning outcomes, finding that undergraduate students needed less support than graduate students when navigating an online course. ^ Beed, P., Hawkins, M., & Roller, C. (1991). Moving learners towards independence: the power of scaffolded instruction. The Reading Teacher, 44(9), 648–655. ^ Wood, D., & Wood, H. (1996). Vygotsky, tutoring and learning. Oxford Review of Education, 22(1), 5–16. ^ a b Palincsar, A. S. (1986). The role of dialogue in providing scaffolded instruction. Educational Psychologist, 21(1 & 2), 73–98. ^ a b Wood, D., Bruner, J., & Ross, G. (1976). The role of tutoring in problem solving. Journal of Child Psychology and Psychiatry, 17, 89–100. ^ Graves, M., Graves, M., & Braaten, S. (1996). Scaffolding reading experiences for inclusive classes. Educational Leadership, 53(5), 14–16. ^ a b Rosenshine, B., & Meister, C. (1992). The use of scaVolds for teaching higher-level cognitive strategies. Educational Leadership, 49(7), 26–33. ^ Schetz, K., & Stremmel, A. (1994). Teacher-assisted computer implementation: a Vygotskian perspective. Early Education and Development, 5(1), 18–26. ^ Vygotsky, L. (1934/1986). Thought and language. Cambridge, MA: MIT Press. ^ Santrock, J (2004). A Topical Approach To Life-Span Development. Chapter 6 Cognitive Development Approaches (200 – 225). New York, NY: McGraw-Hill. ^ Landry, S. H.; Miller-Loncar, C. L.; Smith, K. E.; Swank, P. R. (2002). "The role of early parenting in children's development of executive processes". Developmental Neuropsychology. 21 (1): 15–41. doi:10.1207/s15326942dn2101_2. PMID 12058834. ^ Daniels, H. (1994). Literature Circles: Voice and choice in the student-centered classroom. Markham: Pembroke Publishers Ltd.
^ a b Bakhtin, M.M. (1981) The Dialogic Imagination: Four Essays by M. M. Bakhtin. Edited by M. Holquist and translated by C. Emerson and M. Holquist. Austin: University of Texas Press. ^ a b c Van Lier, L. (1996) Interaction in the Language Curriculum: Awareness, Autonomy, and Authenticity. London: Longman. ^ a b Nassaji, H. and Wells, G. (2000) What's the use of "triadic dialogue"? An investigation of teacher-student interaction. Applied Linguistics 21 (3): 376--406. ^ Saxena, M. (2009) Negotiating conflicting ideologies and linguistic otherness: codeswitching in English classrooms. English Teaching: Practice and Critique 8 (2): 167-- 187. ^ Nystrand, M. (1997) Opening Dialogue: Understanding the Dynamics of Language and Learning in the English Classroom. New York: Teachers College Press. ^ Sweller, J., Kirschner, P.A., and Clark, R. E. (2007). Why Minimally Guided Teaching Techniques Do Not Work: A Reply to Commentaries. Educational Psychologist, 42(2), 115–121. ^ Wieman, C., & Perkins, K. (2005). Transforming physics education. Physics Today, 59(11), 36–41. ^ Hrepic, Z., Zollman, D. A., & Rebello, N. S. (2007). Comparing students' and experts' understanding of the content of a lecture. Journal of Science Education and Technology, 16(3), 213-224. ^ Hake, R. R. (1998). Interactive engagement versus traditional methods: A six-thousand-student survey of mechanics test data for introductory physics course. American Journal of Physics, 66(1), 64–74. ^ Capon, N., & Kuhn, D. (2004). What's so good about problem-based learning? Cognition and Instruction, 22, 61-79. ^ Miller, C., Lehman, J., & Koedinger, K. (1999). Goals and learning in microworlds. Cognitive Science, 23, 305-336. ^ Swartz, D.L., & Martin, T. (2004). Inventing to prepare for learning: The hidden efficiency of original student production in statistics instruction. Cognition and Instruction, 22, 129–184. ^ Carroll, W. (1994). Using worked examples as instructional support in the algebra classroom. Journal of Educational Psychology, 86, 360–367. ^ Trafton, J. G., & Reiser, B. J., (1993). The contribution of studying examples and solving problems to skill acquisition. Paper presented at the 15th Annual Conference of the Cognitive Science Society. ^ a b John R. Anderson; Albert T. Corbett; Kenneth R. Koedinger; Ray Pelletier The Journal of the Learning Sciences, Vol. 4, No. 2. (1995), pp. 167-207. ^ Mathan, S., & Koedinger, K. R. (2003). Recasting the feedback debate: Benefits of tutoring error detection and correction skills. In U. Hoppe, F. Verdejo, & J. Kay (Eds. ), Artificial intelligence in education: Shaping the future of learning through intelligent technologies (pp. 13-20). Amsterdam: IOS Press. ^ Jonassen, D. H. (1991). Objectivism versus constructivism: do we need a new philosophical paradigm? Educational Technology Research and Development, 39 (3), 5-14. ^ Steffe, L. & Gale, J. (Eds.) (1995). Constructivism in education. New Jersey: Lawrence Erlbaum Associates,Inc. ^ Kirschner, P. A. (1992). Epistemology, practical work and academic skills in science education. Science and Education, 1, 273– 299. ^ van Joolingen, W. R., de Jong, T., Lazonder, A. W., Savelsbergh, E., & Manlove, S. (2005). Co-Lab: Research and development of an on-line learning environment for collaborative scientific discovery learning. Computers in Human Behavior, 21, 671-688. ^ Jonassen, D. H. (Ed.). (1996). Handbook of research for educational communications and technology. New York: Simon & Schuster. ^ a b c Johnson, G. (2009). Instructionism and Constructivism: Reconciling Two Very Good Ideas. International Journal of Special Education, 24(3), 90-98. ^ Adams, G. L., & Engelmann, S. (1996). Research on Direct Instruction: 25 years beyond DISTAR. Seattle, WA: Educational Achievement Systems. ^ a b "Search Funded Research Grants and Contracts - Details". ed.gov. Retrieved 31 December 2016. ^ Northern Illinois University, Faculty Development and Instructional Design Center. ^ "Advance Organizer - EduTech Wiki". unige.ch. Retrieved 31 December 2016. ^ "Modeling". learnnc.org. Retrieved 31 December 2016. ^ Tharp, R. G., & Gallimore, R. (1988). Rousing minds to life: Teaching, learning, and schooling in social context. Cambridge: Cambridge University Press. ^ "handouts". wmin.ac.uk. Retrieved 31 December 2016. ^ "Prompting as a Tool to Support Behavioral and Academic Independence". about.com. Retrieved 31 December 2016. ^ a b Hannafin, M., Hill, J. & Land, S. (1999). Student-centered learning and interactive multimedia: Status, issues, and implication. Contemporary Education 68(2): 94–99. ^ Pea, R.D. (2004). The social and technological dimensions of scaffolding and related theoretical concepts for learning, education, and human activity. Journal of the Learning Sciences 13: 423–451. ^ Reiser, B. (2004). Scaffolding complex learning: The mechanisms of structuring and problematizing student work. Journal of the Learning Sciences 13930: 273–304. ^ M. J. Hannafin, S. Land and K. Oliver, "Open learning environments: Foundations, methods and models," in C.M. Reigeluth (Ed. ), Instructional-design theories and models: A new paradigm of instructional theory, Mahwah, NJ: Lawrence Erlbaum Associates, 1999, pp. 115-140. ^ Hill, J. & Hannafin, M. (1997). Cognitive strategies and learning from the World Wide Web. Educational Technology Research & Development 45(4): 37–64. ^ Baylor, A. L. (2002). Agent-based learning environments for investigating teaching and learning. Journal of Educational Computing Research 26(3): 249–270. ^ Puntambekar, S. & Hubscher, R. (2005). Tools for scaffolding students in a complex learning environment: What have we gained and what have we missed? Educational Psychologist 40(1): 1–12. ^ H. Huang, C. Wu and N. Chen, "The effectiveness of using procedural scaffolding in a paper-plus-smartphone collaborative learning context," Computers & Education, vol. 59, no. 2, pp. 250- 259, 2012. ^ a b R. Reingold, R.Rimor, and A. Kalay, "Instructor's scaffolding in support of student's metacognition through a teacher education online course: a case study," Journal of Intercative Online Learning, vol. 7, no. 2, pp. 139-151, 2008. ^ a b Cho, Moon-Heum; Cho, YoonJung (April 2014). "Instructor scaffolding for interaction and students' academic engagement in online learning: Mediating role of perceived online class goal structures". The Internet and Higher Education. 21: 25–30. doi:10.1016/j.iheduc.2013.10.008 – via Science Direct. ^ Tuckman, Bruce (Summer 2005). "Relations of academic procrastination, rationalizations, and performance in a web course with deadlines". Psychological Reports. 96 (4): 1015–1021. doi:10.2466/PR0.96.4.1015-1021 – via Sage Journals. ^ Cho, Moon-Heum; Shen, Demei (Summer 2013). "Self-regulation in online learning". Distance Education. 34 (3): 290–301. doi:10.1080/01587919.2013.835770. ^ Artino, Anthony; Stephens, Jason (December 2009). "Academic motivation and self-regulation: A comparative analysis of undergraduate and graduate students learning online". The Internet and Higher Education. 12 (3–4): 146–151. doi:10.1016/j.iheduc.2009.02.001 – via Science Direct. Belland, Brian., Glazewski, Krista D., and Richardson, Jennifer C. (2008). A scaffolding framework to support the construction of evidence-based arguments among middle school students. Education Tech Research Dev., 56, 401–422. Bodrova, E., & Leong, D. J. (1998). Scaffolding emergent writing in the zone of proximal development. Literacy Teaching and Learning, 3(2), 1–18. Bransford, J., Brown, A., & Cocking, R. (2000). How People Learn: Brain, Mind, and Experience & School. Washington, DC: National Academy Press. Cazden, C. B. (1983). Adult assistance to language development: Scaffolds, models, and direct instruction. In R. P. Parker & F. A. Davis (Eds. ), Developing literacy:Young children's use of language (pp. 3–17). Newark, DE: International Reading Association. Clay, M. M. (2005). Literacy lessons designed for individuals: Teaching procedures. Portsmouth, NH: Heinemann. Cox, B. E. (1994). Young children's regulatory talk: Evidence of emerging metacognitive control over literary products and processes. In R. B. Ruddell, M. R. Ruddell, & H. Singer (Eds. ), Theoretical models and process of reading (pp. 733–756). Newark, DE: IRA. Dorn, L. (1996). A Vygotskian perspective on literacy acquisition: Talk and action in the child's construction of literate awareness. Literacy Teaching and Learning: An International Journal of Early Reading and Writing, 2(2), 15–40. Dyson, A. H. (1983). The role of oral language in early writing process. Research in the Teaching of English, 17(1), 1–30. Dyson, A. H. (1991). Viewpoints: The word and the world - reconceptualizing written language development or do rainbows mean a lot to little girls? Research in the Teaching of English, 25, 97–123. Hoffman, B., & Ritchie, D. (1997). The problems with problem based learning. Instructional Science 25(2) 97–115. Holton, Derek, and Clark, David (2006). Scaffolding and metacognition. International Journal of Mathematical Education in Science and Technology, 37, 127–143. Johnson, G. (2009). Instructionism and Constructivism: Reconciling Two Very Good Ideas. International Journal of Special Education, 24(3), 90–98. Jonassen, D. H. (1991). Objectivism versus constructivism: do we need a new philosophical paradigm? Educational Technology Research and Development, 39 (3), 5–14. Jonassen, D. H. (Ed.). (1996). Handbook of research for educational communications and technology. New York: Simon & Schuster. Lai, Ming and Law, Nancy (2006). Peer scaffolding of knowledge building through collaborative groups with differential learning experiences. J. Educational Computing Research, 35, 123–144. Lajoie, Sussane (2005). Extending the scaffolding metaphor. Instructional Science, 33, 541–557. Luria, A. R. (1983). The development of writing in the child. In M. Martlew (Ed. ), The psychology of written language: Developmental and educational perspectives (pp. 237–277). New York: Wiley. Ninio, A. and Bruner, J. (1978). The achievement and antecedents of labelling. Journal of Child Language, 5, 1–15. Raymond, E. (2000). Cognitive Characteristics. Learners with Mild Disabilities (pp. 169–201). Needham Heights, MA: Allyn & Bacon, A Pearson Education Company. Rodgers, E. M. (2004). Interactions that scaffold reading performance. Journal of Literacy Research, 36(4), 501–532. Rosenshine, B., & Meister, C. (1992). The use of scaffolds for teaching higher-level cognitive strategies. Educational Leadership, 49(7), 26–33. Sawyer, R. Keith. (2006). The Cambridge Handbook of the Learning Sciences. New York: Cambridge University Press. Simons, Krista D., and Klein, James D. (2007). The impact of scaffolding and student achievement levels in a problem-based learning environment. Instructional Science, 35, 41–72. Smagorinsky, P. (2007). Vygotsky and the social dynamic of classrooms. English Journal, 97(2), 61–66. Teale, W. H. & Sulzby, E. (Eds.). (1986). Emergent literacy: Writing and reading. Norwood, NJ: Ablex Publishing Corporation. Vygotsky, L. S. (1987). Thinking and speech. In L. S. Vygotsky, Collected works (vol. 1, pp. 39–285) (R. Rieber & A. Carton, Eds; N. Minick, Trans.). New York: Plenum. (Original works published in 1934, 1960). Wertsch, J. V. & Stone, C. (1984). A social interactional analysis of learning disabilities remediation. Journal of Learning Disabilities, 17(4), 194–199. Wise, A. F., & O'Neill, D. K. (2009). Beyond More Versus Less: A Reframing of the Debate on Instructional Guidance. In S. Tobias & T. M. Duffy (Eds. ), Constructivist Instruction: Success or Failure? (pp. 82–105). New York: Routledge. Wood, D., & Wood, H. (1996). Vygotsky, tutoring and learning. Oxford Review of Education, 22(1), 5–16. Wood, D., Bruner, J., & Ross, G. (1978). The role of tutoring in problem solving. Journal of Child Psychology and Psychiatry, 17, 89–100. Wood, D. J., Bruner, J. S., & Ross, G. (1976). The role of tutoring in problem solving. Journal of Child Psychiatry and Psychology, 17(2), 89–100. Yelland, Nicola, and Masters, Jennifer (2007). Rethinking scaffolding in the information age. Computers and Education, 48, 362–382. This page was last edited on 15 April 2019, at 18:05 (UTC).